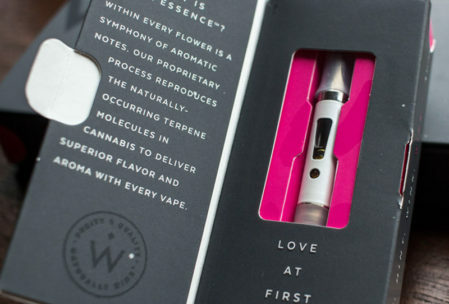 Sleek, discrete, and inevitably subtle W!NK‘s new line of vape pens and flavored cannabis oils are an elegant alternative to other products in the vape market. Created for women, by women, W!NK attempts to fill a void in the cannabis industry by looking to meet specific needs and preferences for women looking for premium products. 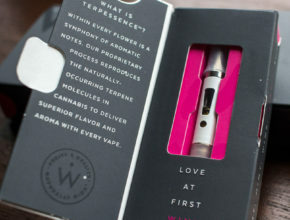 Having just launched this past December we were eager to get our hands on some of their new products including the W!NK Signature Pen, the disposable W!NK Go Pen, and one of their trademarked Terpessence flavor cartridges. 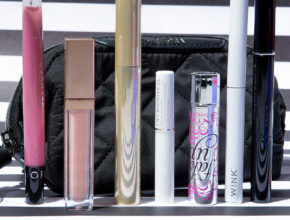 Each and every one of their products is created with women in mind, from its lipstick-like size and stark white color, to the easy flow and consistency of each pull. The W!NK Signature Pen includes an intuitive, stainless steel magnetic cap and maintains the sophisticated aesthetics of the rest of their product line. 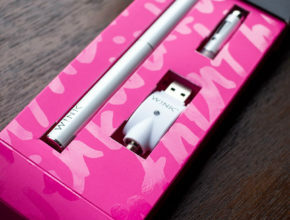 The W!NK Go Pen is a disposable vaporizing pen designed for short term use and comes in a range of signature flavors. Our favorite was the Chocominted flavor. The W!NK cannabis oil refills are sold separately and offer smooth and refined drags with every hit. We tried the Grapephoria flavor and were pleasantly surprised by its mild flavor. 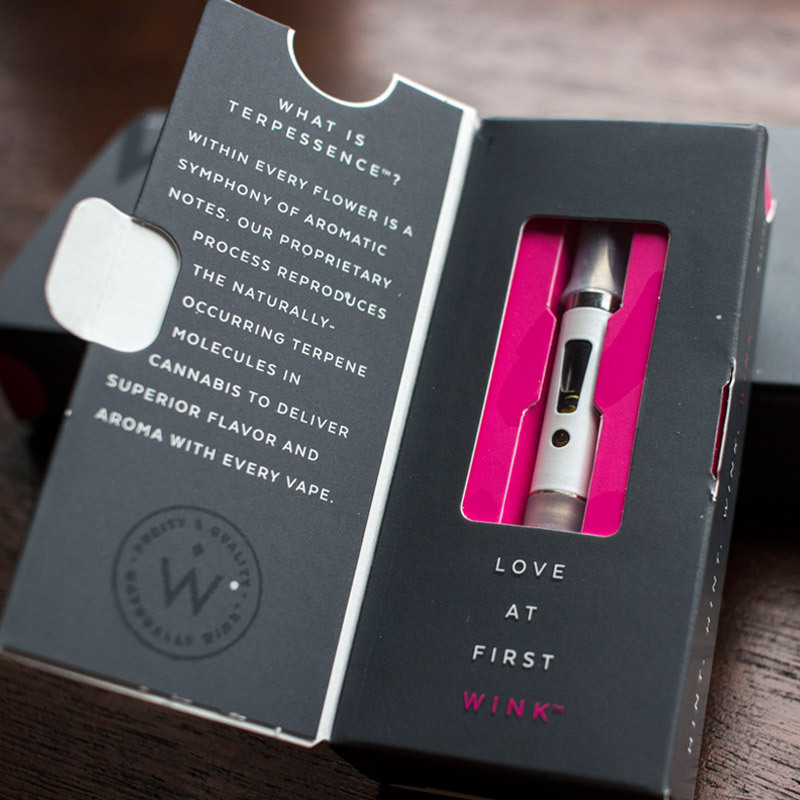 We’ve tried other flavored cannabis oils and have found the flavor to be too overbearing, however W!NK’s flavor cartridge was light and smooth. The W!NK Signature Pen is light-weight and closely resembles the size of a mascara wand, yet despite it’s dainty exterior offers a notably consistent pull at every use – the first hit you take is exactly the same as the last. The pen’s neat magnetic cap is an elegant feature, but what’s most impressive is that it effortlessly fits in any small handbag or jacket pocket, and ultimately does not look like a vaporizer with the cap on. The stainless steel mouthpiece and vape cartridge, which has a clear window, are beautifully designed; you can remove the mouthpiece by simply unscrewing it. The Signature Pen offers a consistent 8-second pull every time, and will fully recharge within an hour of plugging it into its USB charger output, thanks to its quick recharge feature. 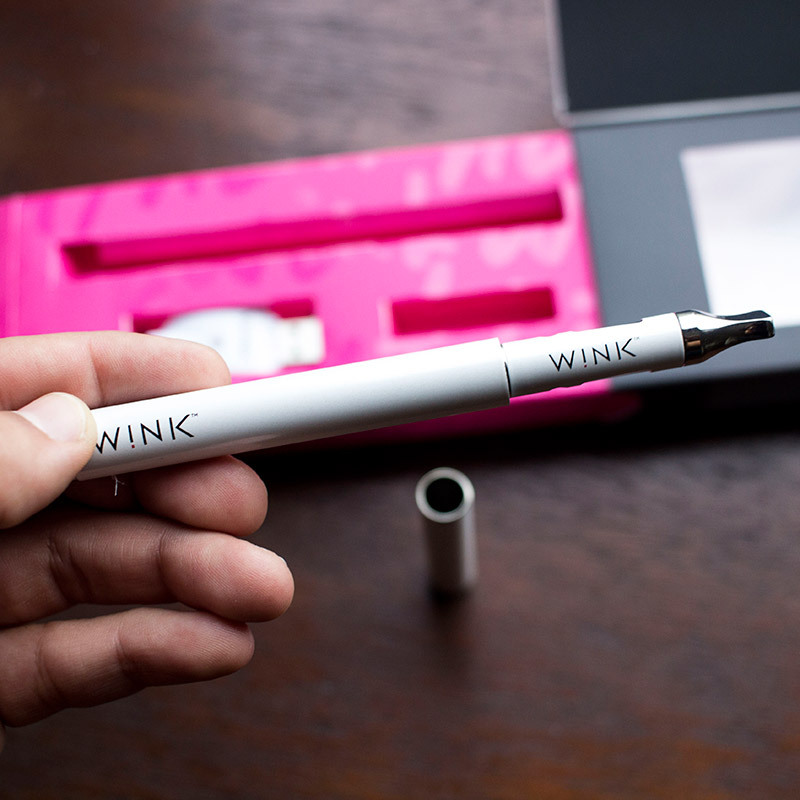 The Signature Pen also comes with a 0.5g empty cartridge in case you’d like to mix your own essential oils. The Grapephoria cartridge is one of seven different flavor cartridges, which all go through W!NK’s proprietary three-step process that reproduces the naturally occurring terpene molecules in cannabis to deliver superior flavor and aroma with every vape. W!NK starts with the highest quality flower and plant material provided by its family of small farmers, then further refines and purifies the original extract which results in fine, high purity, cannabinoid extract which can effectively be standardized into final products. The process ensures that no solvent residues are left. 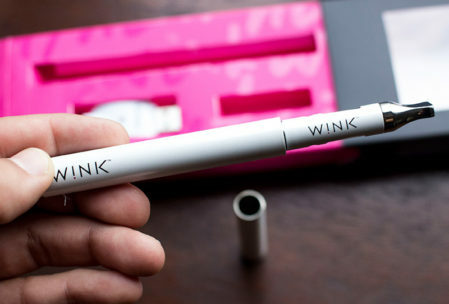 The W!NK Go Pen is the brand’s disposable vaporizing pen that’s meant to be used and then tossed out. Like the Signature Pen, it offers a consistent 8-second pull every time and has a modern and chic exterior, and a ceramic atomizer with Swiss-made kanthal heating coil. 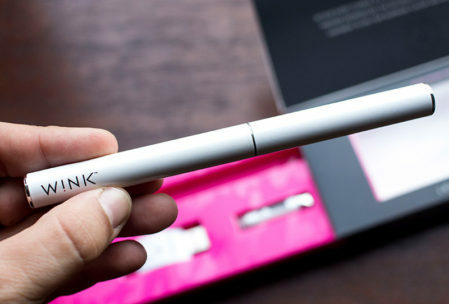 The Go Pen is hands down our favorite product that we tried from the W!NK product line; it’s about the size of a cigarette, fits in the palm of your hand, and is incredibly convenient. All W!NK cannabis oil is CO2 extracted. The Go Pen contains 250 mg of pure cannabis oil and the Terpessence cartridges contains 0.5 g of pure cannabis oil. The first batch of the Grapephoria flavor oil sold in Washington tested at THC 52% / CBD 2.6%. The cannabinoid content is consistent across all W!NK oils. Both the Signature Pen and Go Pen are unbelievable simple to use, and call for the user to simply inhale as to activate the heating coil. You’ll know you’re hitting it when the purple/pink light illuminates around the bottom of the pen. In order to put the cartridge on the Signature Pen, insert the threaded end of the cartridge into the pen. 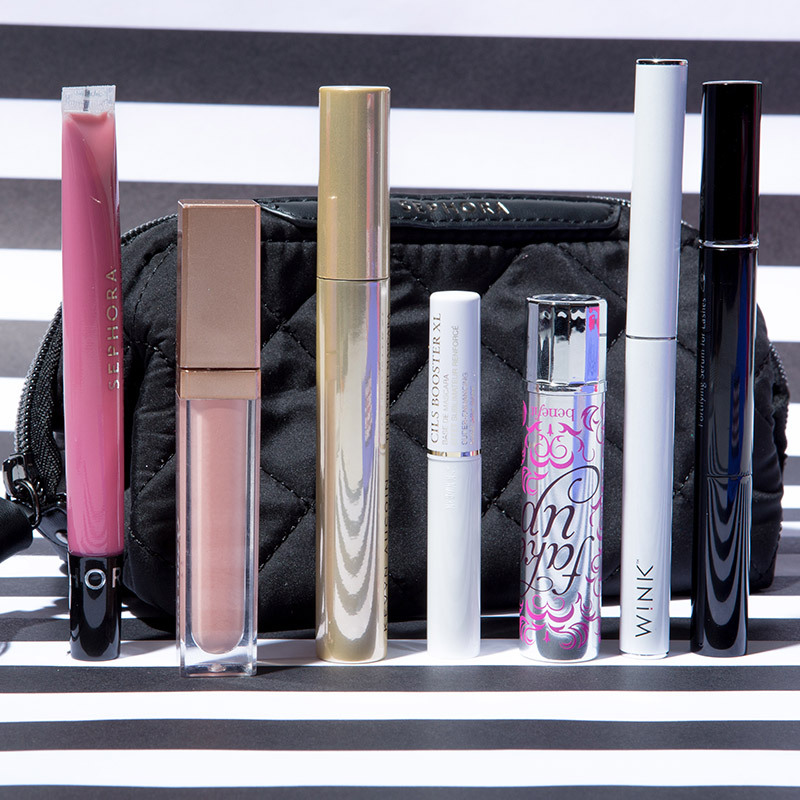 At first we were skeptical about a product that was specifically marketed to women. 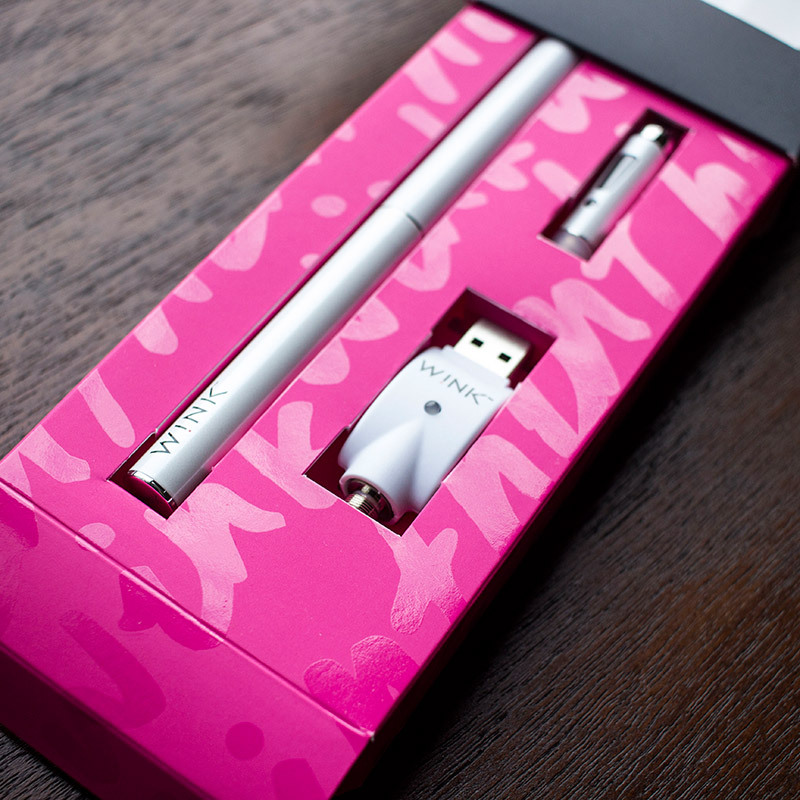 In what ways would this cannabis product cater to the needs and preferences of a woman, more so than any other vape on the market? However, after carrying the small Go Pen around all day while running errands and taking it with us to a friend’s engagement party, we realized a few different features that we were particularly fond up. The size is unbeatable; it fits in the palm of your hand, can easily slip into the pocket of your jeans or jacket, and doesn’t take up any space in a purse or handbag. It’s unbelievably discrete because it’s white like a cigarette and almost exactly the same size and diameter. The Go Pen lasted two days, with us regularly taking two or three drags at a time throughout the day, which gave us a smooth, mild, but noticeable high. We were able to easily go about our day, run errands, and not have a completely clouded head. The Chocominted flavor was incredible, with subtle but refreshing taste and aroma. The Signature Pen’s thin and pen-size design is easy to slip into any purse or bag, and like the Go Pen gives a consistent and seriously smooth pull every single time. Upon inhale the hit is manageable, pleasant, and fluid. The device heats up instantly producing nice vapors. If you’re looking for something that’s unbelievably discrete, fits in almost any pocket, and offers a manageable high with all-day use, then look no further than W!NK’s signature product line. The Go Pen performs surprisingly well for something that’s meant to be tossed after use. If you’re a fan of flavored cannabis oil, then you’ll thoroughly enjoy W!NK’s selection of cartridges. 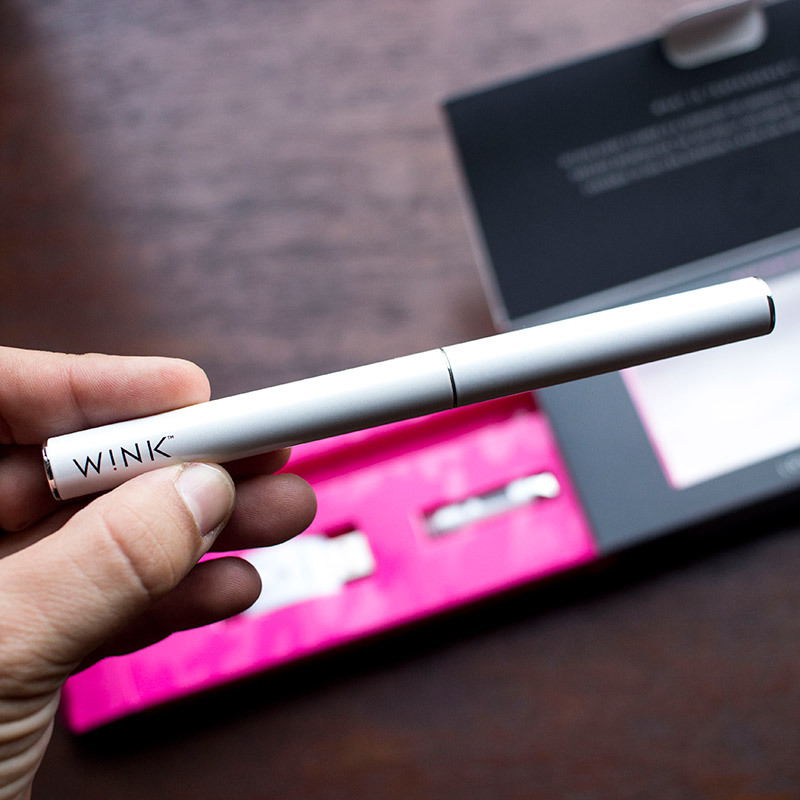 The Signature Pen costs $40.00 and is available online via www.wink-wink.com or at select dispensaries in Western States. 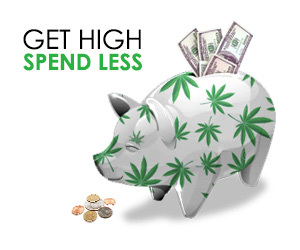 The Go Pen is $35.00 and all flavor cartridges are $45.00. W!NK products are available in licensed dispensaries (available in over 20 dispensaries in Washington). W!NK is expected to launch in California later this year. Excellent vape pens ! I tried the bubble & the grapephoria both are great I would definitely buy these again.